Tungsten Analysis: WC Preview Part 13 - Danger, danger! Bad walk on music! WC Preview Part 13 - Danger, danger! Bad walk on music! 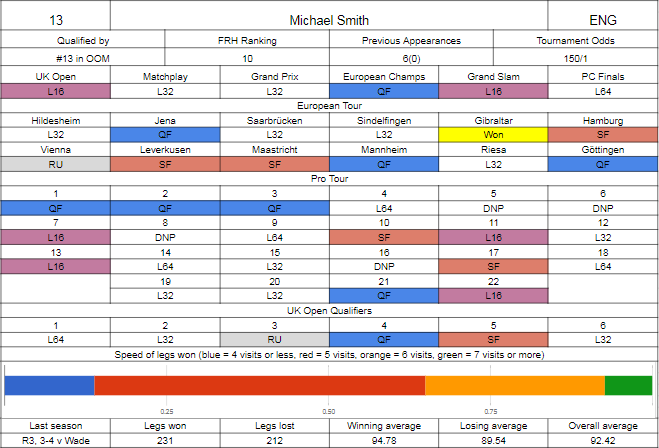 Smith's had an up and down season, with the one big highlight being the breaking of the duopoly that Peter Wright and Michael van Gerwen had on the European Tour titles, claiming the win in Gibraltar with a series of incredibly nail biting victories over Christian Kist, Dimitri van den Bergh, Rob Cross, Peter Wright and Mensur Suljovic, every single one (except the final, which was 6-4) going to a deciding leg. Some bottle. 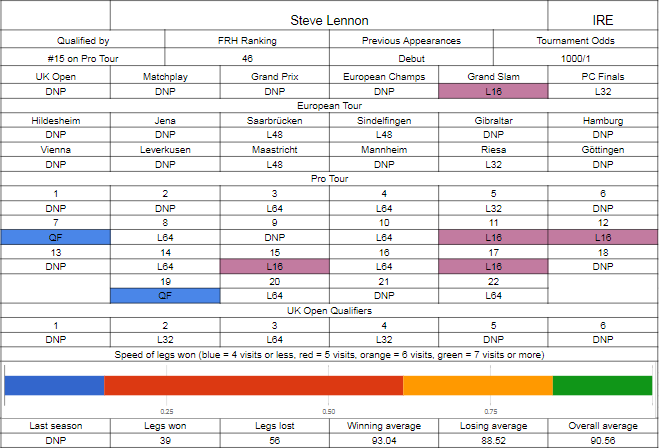 His early season on the floor was very good, with five quarter finals (three in UK Open qualifiers, one of those seeing him get to the final with a good scalp list of Lewis, Wade, Reyes and White) before the UK Open, where he got to the last sixteen and went out to Alan Norris. His European form, Gibraltar win aside, was excellent with seven excursions into the final session, nearly adding a second title in Vienna, but having the throw in a deciding leg, he saw van Gerwen finish in twelve darts when it mattered the most, waiting on a two darter for the championship. TV's been hit and miss, he ran into an inspired Steve West in Blackpool in the opening round, lost a deciding set to Gerwyn Price in Dublin despite having the throw, while in Hasselt he reached the quarter finals, beating Nathan Aspinall and Benito van de Pas before Rob Cross proved to be too strong. His Gibraltar win got him into the Grand Slam as the last automatic qualifier, and safely navigated a dangerous looking group containing Mensur Suljovic, Mark McGeeney and James Wilson, but only finishing second put him up against Gary Anderson in the last 16, resulting in a 10-6 loss. The last time we saw him, he was a surprising first round exit in Minehead to Jan Dekker, and it's those sorts of results, as well as not really punching through to the quarter final stages or later of TV events when he gets going, that are keeping him out of the official top 10 and real Premier League contention. Lennon's a new face on the scene who after two good runs in the opening two days of Q-School (losing to Prakash Jiwa in the final round on day one and Maik Langendorf in the penultimate round on day two), claimed his card outright on day three. This level of solid runs on three straight days indicated he might be useful on the floor, and while it took him a while to get going properly, only doing enough to make the early rounds of the UK Open where he went out to Willie O'Connor, once he did he was able to clock up enough money to sneak in to Ally Pally as one of the last Pro Tour qualifiers. The first big run was in event seven to the quarters, knocking out Ian White along the way and perhaps unfortunate to lose a deciding leg to Daryl Gurney, and in mid season he'd tack on four board victories before getting back to the quarter final stage on home soil, beating West and Bunting before again possibly having the chance to go further, missing out on a semi final by losing 6-5 to Antonio Alcinas. He's added on five grand in Europe, getting to four events but only managing the one stage win, over Simon Stevenson in Riesa. Critically, he was able to qualify for the Grand Slam through the wildcard qualifier, a hat trick of wins over van den Bergh, Beaton and Cullen getting him there, and gained some good stage experience, only picking up the one win 5-0 over Jamie Hughes, but that was enough to see him move through to the last 16 on leg difference where van Gerwen ran out an easy 10-3 winner. He did enough to make the Players Championship Finals, but after beating Zoran Lerchbacher he went out to Rob Cross in round two. I think this might be a bit too soon for Lennon - his numbers indicate he can play, and if Smith doesn't hit the ground running Lennon should be able to cause a bit of nervousness, but I get the feeling that he's not quite got to the level where he can truly move his floor game to the stage. It's a big opportunity for Smith, the draw is probably the toughest for a top 16 seed in the second round, but the quarter as a whole, while stacked, doesn't have any top 4 powerhouses. Possibly the most disappointing element of Rob Cross' season is the awful choice of nickname and walk on music. Voltage? Really? And if you're going to go with Electric Six, you pick Gay Bar, it's that simple. Other than that, Cross has had the best debut season of all time to the point where regardless of what happens here, it's going to be extremely difficult to leave him out of the Premier League. Everyone knew that when he won the Challenge Tour in 2016, he'd probably be able to turn that into a solid career, we all saw glimpses of what he could do in the UK Open and realised that, if he attacked the tour properly, he could become much more than that guy van Gerwen threw eighteen perfect darts against. It took him a little while to get properly going, making the money in every UK Open qualifier but only going really deep once, and when he got to the UK Open itself he'd be stopped by Peter Wright in the last sixteen, but from that point on it's basically been "try and stop me". Next event, he wins, beating Norris, Barney, Price and King along the way. The next month starts a run of three straight European Tour quarter finals. 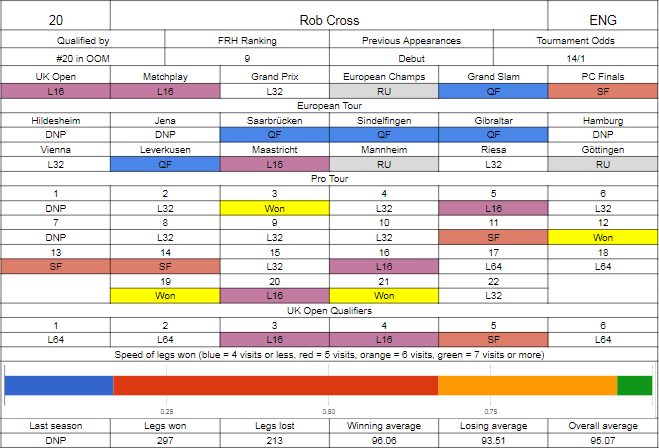 Cross would then slot in four straight Pro Tour semi final appearances, turning one into a win. Already with enough to reach the Matchplay, he'd beat Ian White before giving Adrian Lewis a run for his money in the last sixteen. September onwards would see him really hit the gas - reaching a first European final and only the world number one could deny him, winning a third Pro Tour event just before the Grand Prix, which would be his only real hiccup, a one sided first round defeat to Steve Beaton, and then claiming the fourth Players Championship title of the season in the final weekend to see him lead that ranking at the end of the season. Another European Tour final loss to van Gerwen (who, I should mention, he has beaten this year in Leverkusen) would end things before the TV run. A final in the European Championship would get him to the Grand Slam, again denied by van Gerwen but with some excellent displays along the way, the week after van Gerwen would knock him out at the quarter final stage of the World Series finals, in the Grand Slam he'd finish second in the van Gerwen group and rematch at the quarter finals, a 16-13 defeat showing how close he is getting, and it looked all set for another matchup in Minehead, but Jonny Clayton was able to pull off the shock at the semi final stage. It's not unrealistic to say that van Gerwen may be the only player who could stop Cross here. Asada makes his PDC debut having previously appeared at Lakeside for the last three years - losing in the prelims to Jeff Smith last year and Brian Dawson in 2015, but in 2016 he did beat rumoured PDC switcher Darius Labanauskas before taking Wesley Harms to a deciding set in the first round proper. Like many on the Asian circuits, he mixes soft tip and steel tip, making the semi final of the Japanese Dartslive event in August, while he's also cleaned up in the Japan Open five out of the last six years. He made it here by winning through the PDC Japanese qualifier, which in the past has brought us Haruki Muramatsu, the late Morihiro Hashimoto, and in the last couple of seasons we've had Keita Ono and Masumi Chino. 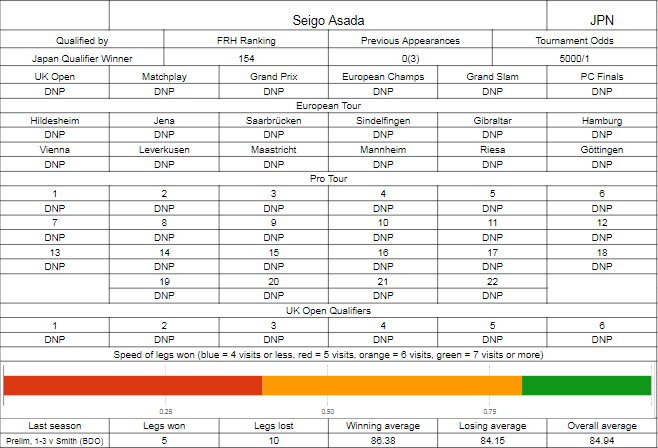 None of them have been awful, usually coming through the prelim but often getting really hard draws (Ono got Taylor, Hashimoto's last effort saw him get Smith in the year Smith was playing well enough to beat Taylor, and Anderson the time before that, Muramatsu drew Whitlock and Taylor in his last two attempts) so it's hard to gauge their strength. There wasn't a World Series event in Japan this year to look at (or, if there was, it's been very well hidden), but Asada lost 6-1 to Gary Anderson in 2016 averaging 77, so there's that. 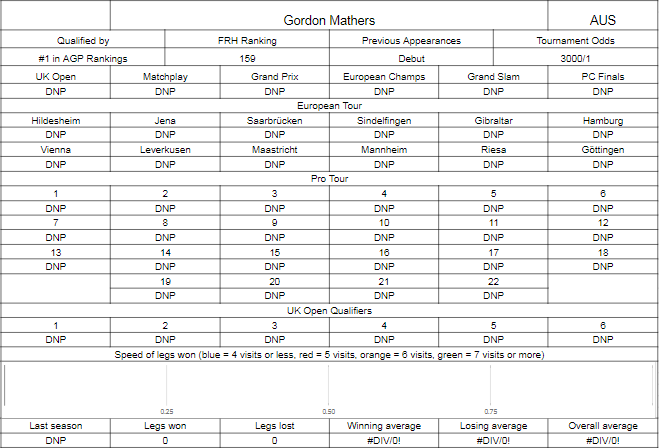 Mathers has made it here by topping the DPA ranking chart, an increasingly strong series where Corey Cadby was only able to finish third, with Rhys Mathewson not quite being able to get over the line in the last couple of events. The top ten of that tour also includes the likes of Tic Bridge, Koha Kokiri and Cody Harris, none of whom have seemed like mugs when seen on TV. Mathers won three events on the circuit, a weekend double with final wins over Cadby and Kokiri in Western Australia in early April, adding the last one over Cadby again in Queensland in May. We've yet to see him on the World Series tour, not qualifying or being invited to any of the relevant events in the area, so it's tough to gauge any sort of stage form for him either. The prelim seems like it should be close, and both players should be treating this as a final, as neither is going to get remotely close to Cross on current form.